accessories, also called "Smart Jackets" that extend its capabilities with additions such as extra battery life, connectivity ports, keyboard , stylus or memory-card slots. We try to find out if the tablet can become your only computing device replacing the laptop. current generation iPad. The table is mostly made of aluminium barring a black strip at the back, towards the top that is made of plastic and encloses the cellular and Wi-Fi antennas. The aluminium back extends till the front enclosing the bezel. However the bezel is not flush with the frame and there's some gap. It has rounded corners. Looking at the tablet from the front in landscape mode (horizontally), you will find a power/screen-lock button on the top left edge of the tablet, and a screen rotation lock and 3.5mm headset jack on top right edge. There's also a volume rocker on the left side, towards the back of the tablet. We found this a little odd as you won't have access to it if the tablet is lying on its back on a hard surface. There's a flap for the micro-SIM card and microSD card at nearly the same position on the right side. The flap opens through a pin-hole based ejection mechanism similar to the solution found in some smartphones. The 8-megapixel rear shooter and a LED flash are located at the top right corner (looking at the tablet's back in landscape mode). There's a proprietary connector and two speaker grills at the bottom. The front of the tablet is dominated by the 10-inch display. There's a Windows hardware button sitting in the middle, below the display, and a front facing camera capable of recording 1080p video, above the display. Overall, we found the HP ElitePad 900 to be sturdy in terms of build quality and pleasing in terms of design. and images appear sharp and videos look vibrant. However if observed the screen was very reflective and under-sun visibility was not too good. There's one downside; Windows 8 requires a minimum resolution of 1366x768 pixels if you want to snap apps. The snap mode allows users to run and view two apps simultaneously. There are reports that Microsoft plans to change the requirement with the Windows Blue update but for now you'd not be able to use this functionality with the ElitePad tablet. Touch was pretty responsive, however, desktop apps with small buttons are a little difficult to use and we'd recommend a stylus (not included) for that. 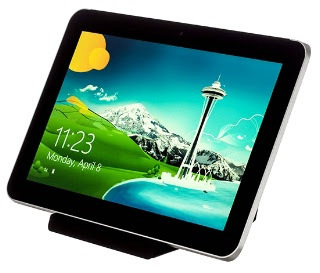 turns the tablet into a desktop PC making it fit for business use. Our review unit came with two jackets. One of them was the expansion jacket that offers two USB ports, an HDMI port and a SD/MMC card reader. The jacket can also accommodate an extra battery that has to be purchased separately. As per HP the extra battery can increase the tablet's backup to up to 20 hours. The jacket increases the bulk of the tablet but has a soft rubber finish making the tablet easier to hold. One has to slide the tablet inside the jacket by removing the top. The detachable part does not latch tightly so if someone holds the tablet from the top, it might slide away.